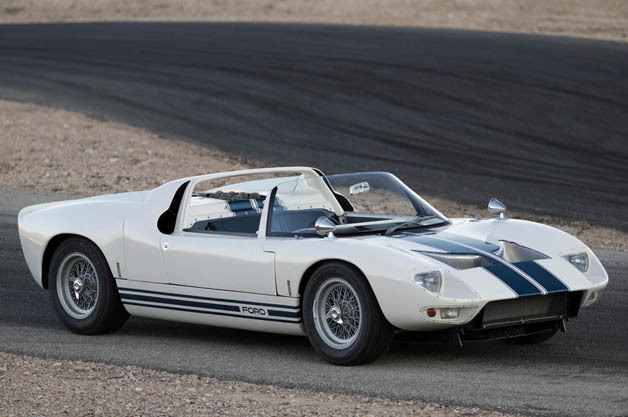 The 2014 RM Auctions event set to go down during the Pebble Beach Concours d'Elegance in just over a week will feature a very rare 1965 Ford GT40 roadsterprototype. Chassis GT/108 was the seventh car built after the first GT40 (which bore chassis number GT/101) and one of just four GT40 roadsters ever built. This video provides a few details on this car, highlighting its role in the evolution of Ford's race-winning design. Powered by a 289-cubic-inch V-8, it features the modified front end used on road-going GT40s, combined with a roadster-specific lowered tail. The car apparently served as a development mule for Ford and Shelby, but only briefly. It was sold into private hands later in 1965 through Kar Kraft, and has been in the same owner's collection for the past 20 years. GT/108 is still drivable, and looks pretty darn good on a track. Hopefully its new owner will know better than to keep it locked away in a warehouse as an "investment." RM Auctions' pre-sale estimate of $8 million to $10 million tops the $7 million paid for a hardtop GT40 prototype at the Barrett-Jackson Palm Beach auction back in April. That rare roadster body will likely justify the premium. Despite its rarity, GT40 chassis GT/108 will have to fight for attention at the RM Auctions Monterey sale August 15-16. With cars like a 1931 Bentley 8-Litre Barker Sports Coupe Cabriolet, a 1971 Lamborghini Miura SV, and a barn-find 1961 Aston Martin DB4 crossing the block, it should be almost impressive as the Pebble Beach Concours itself.